Have you ever thought of the amount of fertilizer, water and electricity it takes to maintain a whole field? Well, it can be quite a lot. That is why you should think of conservation efforts such as installation of solar panels and using water harvesting techniques that will save as much water as possible. You should also consider using compost fertilizers so that you do not spend too much money paying for fertilizer. The structures around should also be made using eco-friendly material such as grass thatch. The number of golf courses around the world is reducing. With businessmen opting to sell golf courses for development, more people are looking for places where they can tee. Some of them will have to travel a long distance to access a golf course and will therefore not appreciate when they have to disrupt their sessions to allow for maintenance. That is why you should always have a scheduled time when people are not playing. 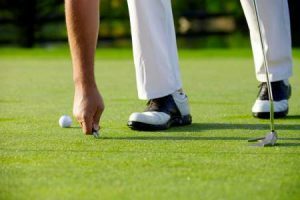 The small crater that is often made when the ball falls from the sky and hit the putting should be addressed as soon as possible. If you leave it for longer, the holes can ruin the healthy grass and create bumps that will take long to repair. Over time, the sand bunkers in golf courses get eroded when golfers walk or drive across them. The maintenance team should identify a low spot and start raking the bunker from there. You can buy cheap rakes online and even get some of the golfers to join in the raking. Golf carts are an important part of the game of golf and they should be well maintained. Make sure they are maintained annually and movable parts are well greased for easy movement. You should check the batteries after every two weeks. The outer body should be dusted regularly, especially during the dry season. Trees play a very big role in the ecosystem around the golf course. They provide shade in those heated months when the sun is scorching. They also render a beautiful scene that makes golf courses stand out. Ensure the trees are well maintained through regular pruning and spraying if necessary. All hanging limbs should be regularly cut down so that the trees look beautiful. The lush grass in golf courses needs regular watering; sometimes more than once a day. This means that you will have to make your lighting waterproof so that they do not get saturated and ruined during the watering period. You should also ensure all the electric wires around the golf course are insulated to prevent shocks and accidents.